Bible (Biblia Sacra Latina, Versio Vulgata). France, Early 13th Century. Latin Text; Early Angular Gothic Script. Observations: This leaf is one of the larger ones in the portfolio. The vellum is very thin, fine, and white, with only a minimum of yellowing (due to dirt rather than the quality of the vellum). Holes from both the binding and lining, which is in lead, are evident. 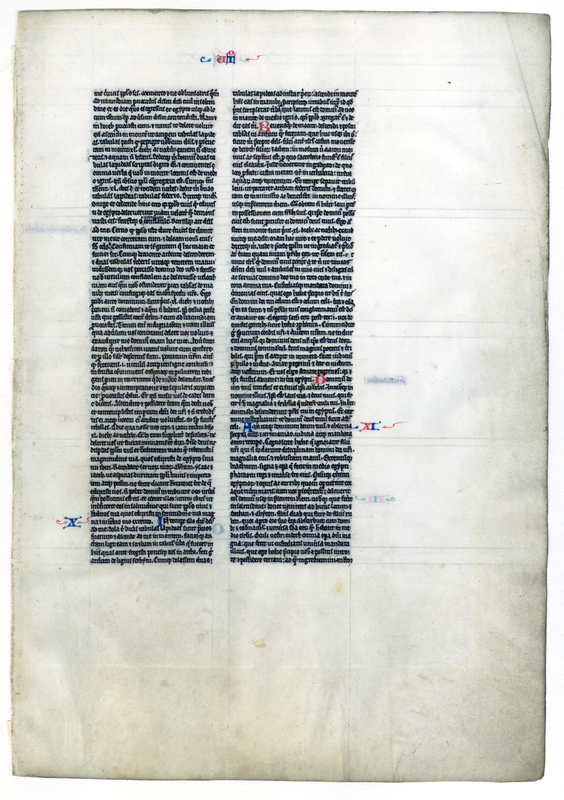 The bulk of the text is in black ink, with decoration and highlighting in both red and blue. Corrections appear both above the words and in the left margin of the verso; corrections are highlighted in red. Decorations are minimal, including a few squiggle flourishes accompanying the marginal chapter numbers, as well as book names and the beginnings of verses, and guide letters for the initials. All the leaves we have seen in the portfolios have text from the Hebrew Scriptures (i.e., the Old Testament). Text: Deuteronomy 9:6-11:9 (recto) and 11:9-12:29 (verso). Reconstruction Note! In Ege's original manuscript, this leaf followed what is now Leaf 05 in the Ohio State University portfolio. Together they contain the text of Deuteronomy 5:5-12:29.